Located in an old tram depot in Woluwe-Saint-Pierre this museum exhibits artefacts (trams, buses) from Brussels’ transportation history. It’s a cute 1500 meter square exhibit with lots of nostalgic elements - motor cars, horse drawn carriages, trailers, trolleybuses, autobus, service cars and taxis. The museum is not always open. In fact, it is closed for most of the year, and open some days between March and September. The most fun part is riding out in one of these historical vehicles to the Sonian Forest, Avenue de Tervuren, or Cinquantenaire Park. You can also rent the vehicles for your own events. EUR 4 for kids 6-12. Group guided tour: EUR 30 + EUR 6 per extra person. The museum always opens at 1pm, but may close anytime between 5pm and 7pm depending on the calendar. Park your car on Rue Leybeek. Trams 39, 94, 44; Buses 36, 42 stop Trammuseum. How popular is Tram Museum? People normally also visit Rouge Cloitre Abbey And Park while planning their trip to Tram Museum. As always an amazing experience, ending with a soothing ride in an old wooden 100 y.o. tramway, in the woods to Tervuren. One of the best excursions in Brussels, for kids and adults alike. And all the staff are unpaid volunteers, public transport enthusiasts. A very interesting museum that tells you the recent history of Brussels via its transport network. It's very nice with kids too! 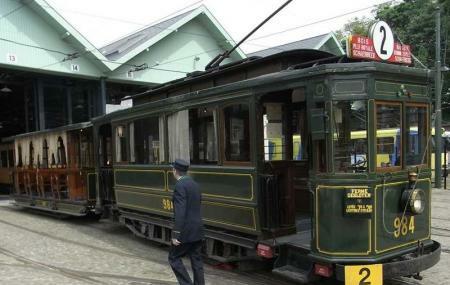 Great place for tram fans or not :) The oldest tram in original condition can be seen. Also the newest metro has a short version and you can see how will look. Can take some old trams to go to the city. You need at least 3 hours for this visit.